Why Do Muslims Flock to the 'Evil West'? Migrants set sail on an inflatable boat from Turkey to the Greek island of Lesbos, August 25, 2015. "The tragedy of the Palestinians," Jordan's (late) King Abdullah wrote in his memoirs, "was that most of their leaders had paralyzed them with false and unsubstantiated promises that they were not alone; that 80 million Arabs and 400 million Muslims would instantly and miraculously come to their rescue." Decades later, Syrians fleeing the civil war in their homeland make up the backbone of the world's refugee tragedy. Officially, Muslim Turkey is home to the largest number of Syrian refugees (1.9 million). Lebanon hosts 1.2 million Syrians; Jordan, more than 600,000; and Egypt, over 100,000. That makes nearly four million predominantly Muslim Syrians. But curiously (or not), the refugees risk their lives trying to cross into the predominantly Christian West, which probably most of them have viewed as the "evil." Hundreds of thousands have made their way into Greece via Turkey, or Italy via Libya, and thousands have drowned in rough crossings as their rubber dinghies often capsize in the Aegean and Mediterranean seas. Millions of Muslims are trying to reach the borders of a civilization they blame for all the world's evils. European Union officials say the refugee crisis "could last years," while European countries work day and night to settle hundreds of thousands of Syrians in their countries. Even faraway non-Muslim countries such as Brazil, Chile and Venezuela have said that they would volunteer to take thousands of refugees. Tragic? No doubt. But who is to blame? According to Turkish President Recep Tayyip Erdogan, it is the West. In March, Erdogan criticized the West for having taken only 250,000 Syrian refugees. And, according to Turkish Prime Minister Ahmet Davutoglu, not Syria's neighbors, but the United Nations Security Council's five permanent members (the U.S., Russia, Britain, France and China), should pay the price. In reality, millions of Muslims are trying, through dangerous ways, to reach the borders of a civilization they have historically blamed for all the world's evils, including in their own countries'. Turkey's leaders are blaming non-Muslims for the tragedy. But they do not speak a single word about super hydrocarbon-rich Muslim countries in their own neighborhood: Not a word about Saudi Arabia, Qatar, the United Arab Emirates, Bahrain and Oman (all of which employ large numbers of Asian workers) has taken a single Muslim Syrian refugee. The migrants know Christian lands are the most decent places to live economically and politically. There is a history showing which hemisphere of the world's political map has treated Muslims refugee problems with relative affection, and which side with visible cruelty. While most Muslims immigrants in the West have successfully integrated in countries like Britain (mostly Muslims from Pakistan and Bangladesh), France (mostly Muslims from North Africa) and Germany (mostly Muslims from Turkey), Arab host countries in the past abstained from giving, for instance, Palestinian refugees full citizenship and other civil rights. In the 1970s and 1980s, when Saudi Arabia faced a labor shortage, it recruited thousands of South Korean and other Asian workers to fill jobs but refused to employ Palestinian refugees. Until the First Gulf War, Kuwait employed big numbers of Palestinians but refused to give them citizenship. After the war, Kuwait expelled 300,000 Palestinian refugees. After the downfall of Saddam Hussein, Palestinian refugees in Iraq faced systematic attacks by Muslim Shia militias. They were denied even medical care. In 2012, at least 300,000 Palestinian refugees were living in Lebanon. Human Rights Watch found their social and economic conditions "appalling." But the Lebanese government persistently ignored their demands for broader property rights. And before the summer of 2012, Egypt maintained a restrictive travel policy for Palestinians who cross into Egypt from Gaza. They had to be escorted by security officials and were sometimes detained. 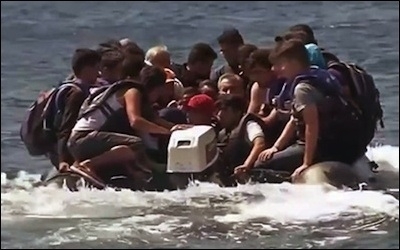 The Syrian refugee crisis in lands stretching from the Middle East into the heart of Europe is another episode in a grandiose, multi-faceted Middle Eastern dilemma: Muslims in this part of the world view the Christian West as "evil;" yet they know Christian lands are the most decent places to live economically and politically. Wealthy Arab states rigidly turn their back on the plight of fellow Muslims who are in need of a helping hand; and Islamist hypocrites blame it all on the West. Sadly, no one questions why "West-hating" Muslims go West; why their fellow Muslim Arab nations do not raise even a helping finger, let alone a hand; or why non-Muslims should pay the price for exclusively intra-Muslim wars and the wave of migrants they create. That is always the easy way out.